The Royal Crown thus becomes a Saxon Crown in reference to Hampshire's early English history, with Winchester being the Capital of the Wessex kingdom from which England arose. Many types of rose have been depicted to symbolise Hampshire over the centuries and here a rose of three tiers - red, white and red - is used to reflect this variety (such as red on the council banner of arms, white on Hampshire cricket). As a unique rose in vexillology it cannot be mistaken for the other roses used in other county flags. The flag was proposed by a number of local organisations, including Hampshire Hockey Association and the Lymington & District Historical Society. Whilst using traditional elements being primarily based on a 1992 design the flag is not considered traditional but received support from the administrative and ceremonial leaders of the county to ensure registration. The design retains the rose and crown pattern used in the county for several centuries in various guises. In 1992 the local county council received a formal grant of arms that included a gold royal crown on a red field, over a red Tudor rose on a gold field. Wishing to include a reference to the county's association with the era of Alfred the Great and his capital of Winchester, Derek Pickett, head of the Wessex Society, adopted my proposal, which replaces the "royal crown" with a specifically Saxon crown. Such a crown also appears in the full achievement of arms used by the council as the crest, symbolising exactly the same Alfredian legacy as intended in this proposed flag. Derek is currently seeking support for his flag from the local great and the good and seems to be making some progress. With any luck, if he can secure the support of some councillors and others of the shire’s notables the good this may achieve the flag’s registration. 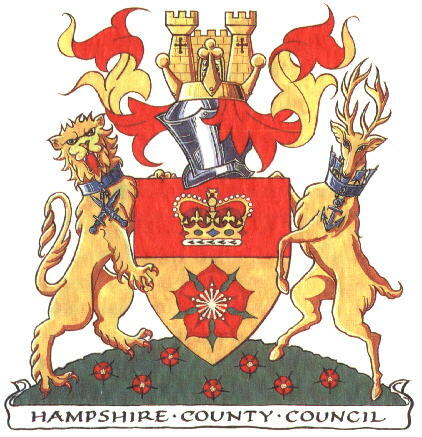 Above the flag of Hampshire County Council, which was adopted on 13th July 1992 when the county was granted a coat of arms to mark the centenary of the county council in 1989 (only two years late!). The flag is a banner of the arms. The "rose and crown" motifs have been associated with Hampshire since at least the 18th century and were formerly used by the county in heraldic badge form (although with no sanction of the College of Arms). Because the arms include the Royal crown, the Queen's permission had to be sought and a Royal Warrant was issued. Q: Can individual elements of the County Council's coat of arms be used to make up the design of other organisation's logos and flags? A: Organisations can only include elements of our coat of arms in their logos and flags if they have been sufficiently redesigned so as not to infringe copyright. For example, the Hampshire rose is used by several organisations in Hampshire, but all look different. Q: Can individuals or organisations fly the County Council flag? A: Unfortunately, we cannot allow others to fly our flag because it represents Hampshire County Council and not the county of Hampshire. Q: How long has the County Council flag been used? A: The red and yellow, ceremonial flag is based on our coat of arms, which was granted in 1992.This flag has been in use since then. The blue flag has been used since early 2002, shortly after our current corporate logo was introduced. I personally saw that flag in 1998 in Winchester during a journey to Birmingham with Michel Lupant. The County Council is the representative body for the county. As arms may only be granted to individuals and bodies corporate, the arms of Hampshire County Council represent the county and its people. No-one other than Hampshire County Council is allowed to fly the flag. The rose is the Lancaster rose, which has been used by Hampshire for many centuries. The lion supporter symbolises the fact that the city of Winchester was the Mediaeval capital of England, and the lion thus is the English lion. The two crossed swords are a symbol for the connection of Hampshire with the army. The stag represents the New Forest, the royal hunting ground created by William the Conqueror in the 11th century. The anchor symbolises the connection with the navy. The crest shows a Saxon crown and castle and symbolises the links with the Saxon Kingdom of Wessex, of which Winchester was the capital. The castle also symbolises the role of Hampshire in defending the country. (Attributed to leaflet obtained from Hampshire County Council). "Design a flag for the county" - according to the Basingstoke Gazette, the "proud Hampshire folk are being urged to help design a flag for their county". A warrant signed by Rt Hon Philip Hammond MP, Secretary of State for Defence, on 23 November 2012, authorised the Blue Ensign of Her Majesty to be worn by vessels owned, chartered or hired by Hampshire Constabulary Marine Unit. The unit currently operates two 7.99 metre Rigid Inflatable Boats ‘Pursuer’ and ‘Protector’, an 11 metre Patrol Launch ‘Preventer’ and a 12 metre Catamaran ‘Commander’.